UPDATED: Thu., Jan. 25, 2018, 11:03 p.m.
Vincent Edwards scored 30 points, Isaac Haas added 24 and No. 3 Purdue matched a school record with its 16 straight victory, using a late charge to finally get past No. 25 Michigan 92-88 on Thursday night in West Lafayette, Indiana. 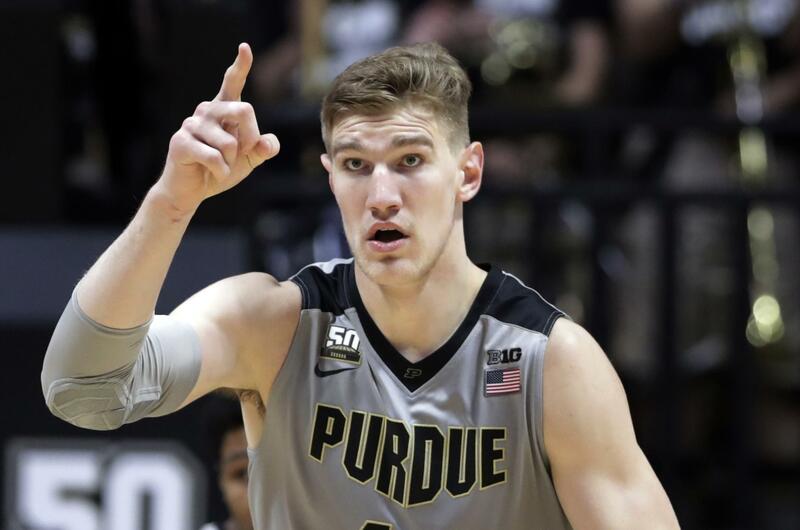 The Boilermakers (20-2, 9-0 Big Ten) have won 20 consecutive games at Mackey Arena and are off to their best start in conference play since the NCAA Tournament began. It’s the fourth time Purdue has won 16 in a row, most recently 30 years ago. Muhammad-Ali Abdur-Rahkman had career-high 26 points and Zavier Simpson added 16 for Michigan (17-6, 6-4). The Wolverines were swept by Purdue in the regular season for the first time since 2007-08. (11) Arizona 80, Colorado 71: Allonzo Trier scored 23 points, Deandre Ayton added 20 and the Wildcats avenged their lone loss of the Pac-12 season, defeating the Buffaloes in Tucson, Arizona. The 7-foot-1 Ayton, expected to be at or near the top of the NBA draft this year, was 12 of 12 at the foul line as the Buffaloes tried to get physical with the big rookie, without much success. Dusan Ristic added 15 points on 7-of-8 shooting for the Wildcats (17-4, 7-1 Pac-12). George King scored 22 points for Colorado (12-9, 4-5). Penn State 82, (13) Ohio State 79: Tony Carr hit a 3-pointer at the buzzer to give the Nittany Lions an upset victory over the Buckeyes at Columbus, Ohio, handing the Buckeyes their first Big Ten loss. Carr had 28 points and was 4 for 5 from 3-point range for the Nittany Lions (14-8, 4-5 Big Ten). They were 11 for 14 from beyond the arc in beating a Top 25 team for the first time this season. Keita Bates-Diop led Ohio State (18-5, 9-1) with 25 points. He had three 3-pointers in the last 2:07, tying it with the last with 5 seconds left. (16) Saint Mary’s 75, BYU 62: Jock Landale had 32 points and 14 rebounds and No. 16 Saint Mary’s pulled away in the second half to beat BYU in Moraga, California, extending the Gaels’ winning streak to 15. Emmett Naar added 13 points and 12 assists and Evan Fitzner made a key 3-pointer late to help the Gaels (20-2, 9-0 West Coast Conference) hold on for their fifth consecutive win over the Cougars (17-5, 6-3). Naar, who came into the game second in the country for assists, needs 33 more to break the school’s career record. TJ Haws scored 15 points, Yoeli Childs added 14 and Elijah Bryant had 13 points and nine assists for BYU. (17) Wichita State 81, Central Florida 62: Shaquille Morris scored 19 points to lead the Shockers over the Golden Knights in Wichita, Kansas. Morris, demoted from his starting spot, was 8 of 10 from the floor in 21 minutes. Darral Willis had 12 points and nine rebounds for the Shockers (16-4, 6-2 American Athletic Conference). Dayon Griffin scored 15 points for Central Florida (13-7, 4-4). Utah 80, (21) Arizona State 77 (OT): Sedrick Barefield scored 17 points and hit the tying 3-pointer with 1.8 seconds left in regulation, helping the Utes defeat the Sun Devils in Tempe, Arizona. Will be updated with BYU at Saint Mary’s. Published: Jan. 25, 2018, 8:21 p.m. Updated: Jan. 25, 2018, 11:03 p.m.